I am taking on the task of reviewing this ebook myself as I am starting to get interested in trading but don’t really know much about it so I think this will be ideal for me to give a beginners prospective of the book. All views are my own. So who’s behind Sports Trading Exposed? 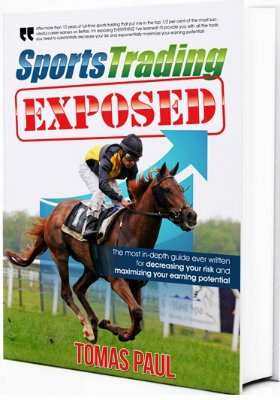 Sports Trading Exposed is written by a professional trader Tomas Paul, he started his trading journey in 2006 and to date claims to have made more than quarter of a million pounds. Straight away I started hearing alarm bells, why would someone who makes that kind of money want to sell an ebook? As I carried on reading he does state that he is bored of trading now. 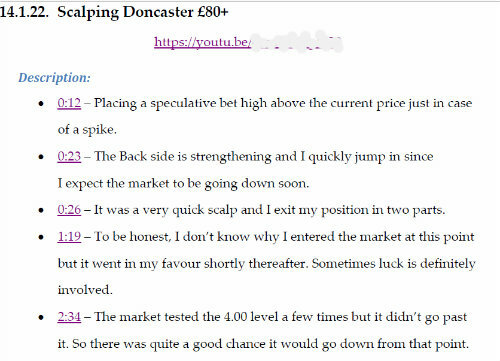 “I have only just started out my trading journey but I can see where he is coming from after 11 years sitting at a pc watching numbers all day”, also he mentions how he dislikes Betfair after they introduced the premium charges which takes a big chunk of his profits. (I would like to get to a stage where I am actually paying premium charges then I know I am doing well). Tomas’s native language is not English although he speaks it very well and the PDF’s are perfectly written English. Another thing to note is when I have had a query his response has been almost immediate which is good to know for anybody who has questions. He also has A FORUM, although it is fairly new and not many members yet it would definitely be worth joining if you purchase the ebook and meet others. You can see the forum here without joining. There is an awful lot of content which you would expect I suppose for 2 reasons…….the price of the book also trading can’t be summed up in a couple of pages. 1/ The theory part literally starts from the beginning of your trading journey, so which software he uses, what size bank, trading tools etc, so if you are new to trading this will be very useful, if you already have experience then some of it will be of no use to you, but then this book caters for a wide range of people so don’t be put off if you already know about bank, software, trading tools ect this is only a small part of the book. I don’t know much about trading but I know how to use betfair (sometimes I wish I didn’t) and I know what backing and laying is. 2/ Practise makes perfect so they say anyway the first part of the practise section is to do with Geeks Toy which is the trading software Tomas uses to trade, he says he would not use anything else. So pages 48 – 86 are all about Geeks Toy and his settings and basically how to use it. 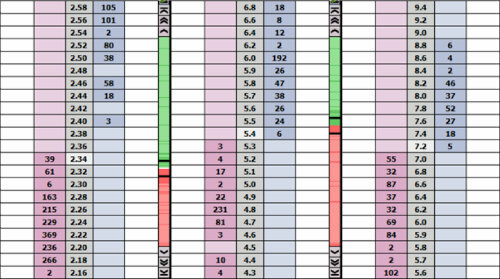 Now I downloaded Geeks Toy, you get a free 14 day trial, once I opened it up and logged in with my Betfair details it was all very confusing, so I found this part of the book very interesting and I have copied Tomas’s settings for now anyway. If you don’t want to use Geeks Toy software then this part of the book is totally irrelevant. There are quite a few pages on money management which I found really interesting, and Tomas states Money Management is one of the most important things in trading. 3/ Video’s Most of his trading is in the UK horse markets and a little on greyhounds, so most the video’s are on UK and Irish horse racing although there are a couple of American and Australian horse races and greyhound racing. There are 45 video’s in total. So you have a description on the video’s which I found very helpful. He doesn’t speak on some of the video’s, occasionally some text will appear explaining what he is doing, before I decided to review this one myself I sent the ebook to a reviewer and he actually thought there was no sound on the video’s. Like I said though the written description is very useful so it’s not really a problem. The ebook has recently been updated and contains his Cheltenham festival 2017 trades and some screenshots of how much he made all with written descriptions. 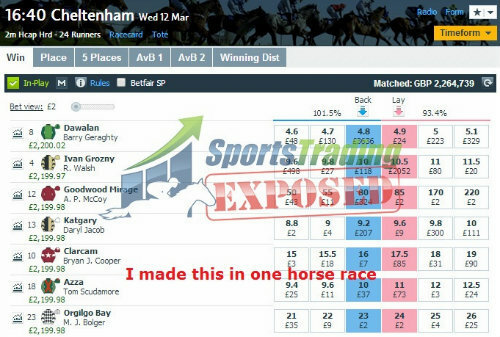 Screenshots like above are great to see that it can actually be achieved but I would like to know what stake he was using to achieve this, he just states he made this is one horse race. I think it’s going to be a few years or 10 before I start seeing green figures like that. My conclusion on Sports Trading Exposed! Tomas states at the beginning of this book that this not a get rich scheme and to be a profitable trader you have to be better than 95% of all the people on the exchanges. His 11 years experience is clearly shown in this ebook and I think I have learnt alot from it since I started putting this ebook into practise. Obviously you can’t follow him 100% as every market is different and what I see in his video’s are never going to happen again as each race is it’s own but following his path has definitely helped me. If you are at the start of your trading journey then this is a must have ebook, it’s very detailed and Tomas clearly knows what he is talking about. If you are past the beginners stage there is still a lot of insight in this book for you to learn from. 11 years worth of trading experience and knowledge summed up into 234 pages. Like Tomas says at the end of the day it’s you who will be pushing the buttons and placing orders no one else, this book will give you guidance and let you see things different from before. Learning to trade takes time and patience. I like the fact that he has created a trading community with his Forum and this can only be a plus if your serious about trading as he will be on hand to give any advice when needed. The price includes all future updates of the book. If you have any questions, leave a comment below. I hope you enjoyed the review. Why does 250k over 10 years ring alarm bells? Although £25k p.a. is good (very good) it doesn’t make the same noises, does it? I mean by alarm bells as if he has earnt 250k from trading why try sell an ebook for £79……but then I explain when I said I read further into the book.